Power Paws can help! The non-slip base on these socks grips onto slippery surfaces to give your dog the traction she needs. Power Paws Non-Slip Dog Socks are also helpful for protecting paw wounds. Pop a Power Paws sock over the injured paw to help protect the injury. They can also be worn on hot pavement as a barrier to extreme heat. Use them as a barrier against pollen, grass or other allergens. These super socks also keep your dog's paws warm & toasty. Does your Greyhound, Whippet or Poodle have difficulties with slipping on wooden or laminate flooring? Designed predominantly for indoor use, Power Paws Dog Socks are very helpful for dogs with hip dysplasia and arthritis. They can help your dog regain the traction needed to stand, walk and stop slipping. Older dogs will regain the confidence they need to be more active. 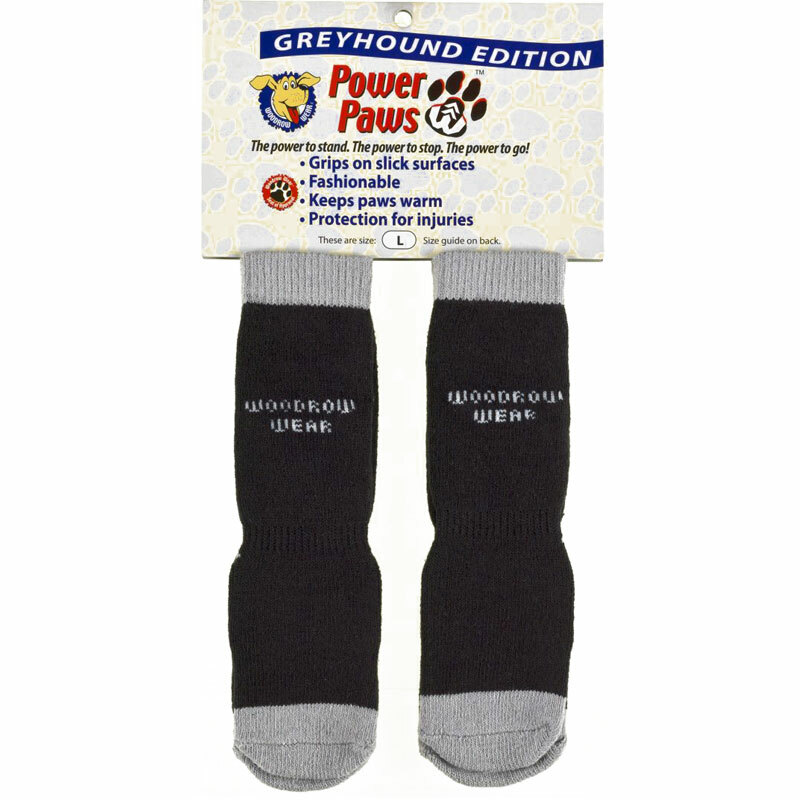 Power Paws Advanced Non-Slip Greyhound Socks are made especially breeds with long narrow paws such as Greyhounds, Whippets, and Poodles. If you have another breed of dog with a more rounded paw, have a look at our regular Power Paws Advanced Dog Socks. A snug fit is key. The elastic in the sock should hold the sock in place. Designed to stretch, Power Paws will stay on during indoor play, stair climbing, walking on slippery surfaces etc. Please use the size chart which provides weight and breed suggestions. Breeds listed are a suggested Guide ONLY - individual fit may vary. A sock that is too large may turn around so the grip is facing the wrong direction or fall off completely. A sock that's too small won't go on. Here's a link to a PDF that you can print out to give you an idea on paw size as well. Power Paws may look small, but they have a lot of stretch in them. You really don’t want a loose fit or they’ll slide around the foot and not provide traction! If you have the right fit the socks will stay on when your dog engages in any activity. The elastic should hold the sock in place. A snug, stretched sock is the sign of a correct fit. If you can fit it on your dog's paw with more than 1 of your fingers inside it's too large. If it flops, falls off or sags it's too big. The sock is close to fitting if it twists but doesn’t fall off immediately. If it rotates so the grip is on the side or top of try washing them in warm water and airing dry. See the washing instructions below as they can help you adjust the size. I have a gorgeous Manchester Terrier whose long claws were doing extensive damage to our fabulous black timber floors. We just had the floors buffed and oiled and they look fantastic. With the patient assistance of Zoe I decided to order the Power Paws Advanced Non-Slip Socks for GREYHOUNDS. At first my little man was very unhappy with them but now, after a week of adjusting he is fine. What I have noticed is that he has calmed down and is so much more relaxed and way less crazy than before. The socks have really de-stressed him and saved my floors from destruction. I cannot rate them highly enough. I am about to order a few more sets and have to say these socks are awesome. This is THE BEST product I have purchased (along with the Dyson cordless vac) in years. I want to rate them more than 5 stars. It is simply not enough. A million thanks to Zoe and Waggle - the Power Paws socks have changed our lives. Read 25 customer reviews of Power Paws Advanced Non-Slip Socks for GREYHOUNDS. The average customer rating is 4.6. The socks fit well. The non slip pads work well to stop my dog from slipping on the wood floor, he rarely take them off himself. These socks have worked well for our, quite large, male Dalmation. He has begun slipping on our floorboards but once the socks are on he trots around the house with ease. We have noticed that after wearing the socks for even just a few hours he gains confidence to walk on the floorboards even without the socks. If he starts slipping again we simply go back to putting the socks on him. Unfortunately we do find that the socks slip off as he gets up and down from his bed but they are by far the best solution we have found for him. excellent product which has given our Greyhound confidence to walk on the new vinyl flooring. My 7yo Boxer decided she couldn't walk on the wood floors anymore, which caused her a great deal of distress, until she finally slipped and fractured her verterbrae. Purchasing the socks was immediate relief. She trots around without a care in the world with absolutely no slipping. It has made her more confident on the floors, so much so that we no longer have to put her back ones on. This was a great solution to the problem without having to spend money on additional rugs and carpets. Nice quality, a good fit, and they stay up. After a while, they sometimes rotate a little, but I would expect that just from walking around or turning over in bed. Jazzy seems happy and comfortable with them on, and they remind her not to lick her allergy-prone paws. My whippet absolutely loves these socks and they save my wooden floorboards too. Guido the Lagotto Romagnolo loved them so much, he chewed them to pieces within 3 days. I cannot tell you how brilliant these socks are. They stay on, they ate soft and comfortable and Nicki our greyhound who has corns was actually very happy to wear them. Thankyou Zoe. W e used the socks on our poodle "Dougie" who had developed a "freak out" response to standing on gloss tiled floors. His response resulted in him sliding on all four paws outwards and ended his belly on the floor - so he was not able to stand and walk away. This stress response makes the claws extend further and so he had no chance of gripping the tiled floors. We used the socks for a couple of days - he got his confidence back and after a couple of days did not need the socks. Great result ! and we will use the same approach next time we visit the other family home with gloss floor tiles- where Dougie had refused to enter the home.